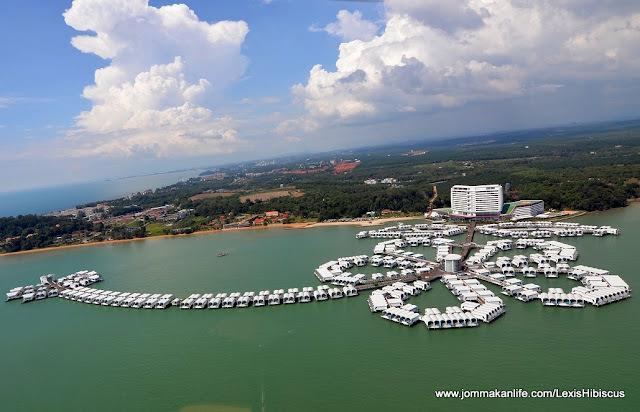 Two Guinness World Records in one go...such a world-class achievement was chalked up by Lexis Hibiscus Port Dickson (PD), one of Malaysia's premier resorts. Verified by officials from Guinness World Records on 14 October 2016, Lexis Hibiscus PD is now the proud holder of two Guinness World Records for 'The Most Swimming Pools in A Resort" (it has 643 en-suite pools) and 'The Most Overwater Villas in A Single Resort" (a total of 522 villas onsite). The resort celebrated its stellar record-breaking feat by hosting an official presentation of the official plaques from Guinness World Records, witnessed by hospitality and tourism industry friends, business partners and the media corp. Pride and exuberance was obvious from the minute we stepped into the Ballroom foyer as we were welcomed by the resort team, most smiling from ear to ear at the auspicious occasion. In his welcome speech, YBhg Dato' Haji Mat Hassan Esa, Chairman of KL Metro Group highlighted how Lexis Hibiscus PD has attracted more than 3.2million tourists from 120 countries to Malaysia and offered plenty of job opportunities to locals. Deputy Minister of Tourism & Culture Malaysia, YB Datuk Mas Ermieyati Samsudin who read the Minister of Tourism & Culture's speech also lauded the resort for the double record-breaking achievements and called on individuals and corporate companies to emulate Lexis Hibiscus PD's stellar success. According to Mr Swapnil Dangarikar, the representative from Guinness World Records, the process to determine and ascertain such unique property developments takes time and applicants need to fulfill strict criteria set by the Guinness World Records organisation. Bursts of enthusiastic applause broke out when the ceremonial presentation of the Guinness World Records official certificates and plaques commenced. Managing Director of KL Metro Group, YBhg Dato' Low Tak Fatt and President of Lexis Hotel Group, Ms Mandy Chew Siok Cheng were present to receive the certs and plaques on behalf of the resort. Heartiest congratulations to the management and staff of Lexis Hibiscus Port Dickson for these double Guinness World Records achievements.